Hockey is more than just our winter game — we lace up our skates together as Canadians. From sponsoring tournaments and teams, installing rink boards and banners, passing out hot drinks and organizing ice times, our Western Financial Group experts “light the lamps” with our love of the game. Our hat trick is being there to assist kids, helping their parents and guardians who travel with them and showing heart and hustle at rinks, Canada-wide, in communities where we live, work and play. Wherever it’s cold enough to freeze — or where ice is made — our provincially licensed brokers live for hockey. Yup — we’re at rinks in British Columbia, Alberta, Saskatchewan, Manitoba and Ontario. 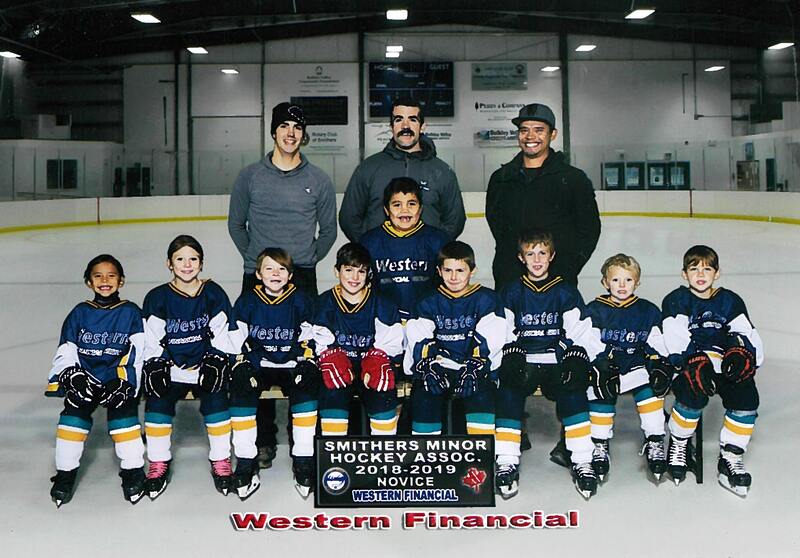 We’ve supported the Smithers Minor Hockey Association (SMHA) for over 20 years. You bet we’ve displayed the team photos from the last two decades in our Smithers brokerage. Look closely; our customers have found themselves — albeit younger — friends, community and family members. We’ve sponsored the novice team the last three seasons, including this 2018/19 season. Our longstanding connection with the SMHA means one thing. We’ve helped kids play the game. The Midget Female A Championship, held at the Caribou Memorial Complex, offered Timberwolves fans tremendous hockey action in March 2018. The stands were packed; the crowd was exuberant. Our Williams Lake brokers were thrilled to help sponsor the Williams Lake Minor Hockey Association (WLMHA) tournament. Congratulations to the T-wolves for winning gold 4-3 in overtime. Dustie Coombes, branch manager, is hands on with her hockey — scheduling ice times for the WLMHA. She added her brokers also enjoyed sponsoring the Pee Wee (Tier 2) tournament in November. Western’s Prince George brokerage sponsored the November 3 game. Twelve insurance experts and family helpers cheered on the Junior A Spruce Kings, provided information and handed goodies to fans. Did you know the community’s adult co-ed team is the Western Financial Group Rangers? With players from across Prince George and area taking to the ice, this sponsorship gets us on the blue line. You’ll see Western front and centre at the Kelowna Minor Hockey (KMH) female tournament from March 15 to 17. Our brokerage team will, once again, cheer the players on and pass out items. For six years, residents and visitors to Cranbrook, BC have known recplex Western Financial Place as a hub, a home away from home — a thrill for sponsor Western Financial Group. “It’s a central point for the community,” Pete Stefano, commercial sales manager at the town’s Western Baker Street branch, said. The Cranbrook RecPlex was renamed Western Financial Place in August 2012. Western, through the naming rights, has sponsored the Western Hockey League’s (WHL) Kootenay Ice hockey team. One program is Reading with the Ice. Players read books with bullying prevention messages to area students. Known as one of Canada’s largest Senior AAA hockey tournaments, the 2019 Allan Cup will be hosted this April in Lacombe with Western as a major sponsor. Held since 1909, the event is steeped in more than 100 years of hockey history. We’ll be there at the Gary Moe Auto Group Sports Plex to cheer on our Lacombe Generals. Western has good reason to celebrate in Nanton, seeing how our brokers will help sponsor the Bantam C Provincial Championship tournament from March 15 to 17, 2019. The 2018/2019 team has players from Nanton, Claresholm and Vulcan. Our brokerages in all three communities wish the team well. Locally, we’re proud to support Nanton Minor Hockey. Sponsorship dollars will fund tournament operation, whereas additional funds will be used to purchase goalie equipment for younger teams, officials said. Go Palominos go! Western Financial Group is a sponsor of the Enmax Hometown Hockey Charity Game on Feb. 23 at the Scott Seaman Outdoor Arena in Black Diamond. Charities include the A-T Children’s Project, Kidsport Okotoks and the Calgary Flames Foundation. The puck drops at 7:30 p.m.
Our insurance experts at the downtown Medicine Hat brokerage and players with the Medicine Hat Tigers (Western Hockey League) supported the 2018/19 Save for Charity campaign. We also partnered with the Medicine Hat and District Food Bank for the season opener against the WHL Lethbridge Hurricanes. In our second year collaborating with the Tigers, $1 will, again, go to a local charity for each save the Tigers’ goalie makes during home games. Some $846 was presented to HALO Medevac Rescue Helicopter from the 2017/18 season and this year’s charity will be selected by Tigers’ officials. Excitement levels were at a fever pitch as Hockey Day in Saskatchewan took over Gull Lake in mid-November. Everyone got into the action, including our brokers who were a key event sponsor. Western’s team was there from the start, assisting on organizing committees, ensuring a smooth event for locals and guests and directing visiting teams to the correct dressing rooms. Congratulations to Glenn Gawdwin — from the Swift Current Broncos — who received the 2017/2018 Most Popular Player award, sponsored by Western Financial Group. Our insurance experts are proud to continue sponsoring the AA and AAA Broncos. Our team sponsored game night with the Shaunavon Badgers senior hockey club. It was an evening of fun draws, conversation and we had hot chocolate and coffee ready for sports fans in the lobby. Western sponsored game night in November for the Wolseley Junior C Mustangs. Our free hot drinks were a big hit and the Shoot to Win contest for $10,000 offered the audience an opportunity to shine. These are only a few of our community hockey engagements we’ve enjoyed at Western Financial Group. Across our network, our brokers are fans of the game and are privileged to support kids and Canada’s hockey culture.